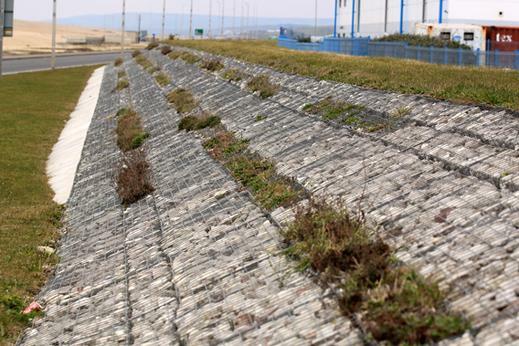 The DURA-FLEX gabion mattress is a mattress shaped container manufactured from heavily galvanized wire to form a flexible and effective surface protection to defend against erosion and scouring. 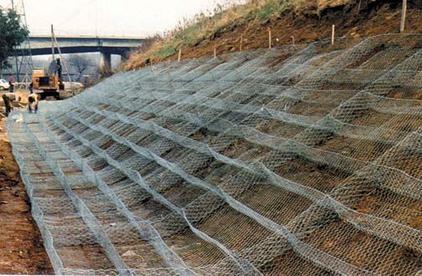 The flexible wire mesh will accommodate significant deformation without failure. The base and sides of the mattress are made of a single sheet of wire mesh (main panel). 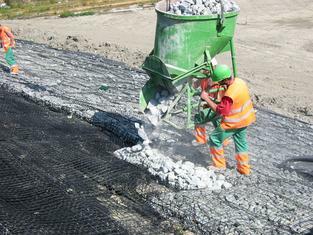 Partition panels (diaphragms) are made of the same wire mesh as the main panel and are attached to the base of the main panel dividing the gabion mattress into 3 foot cells. The lid is formed either by a single sheet or in rolls of a specified length from the same wire as is in the main panel. The mesh shall be woven into a hexagonal pattern with the joints formed by twisting each pair of wires through three and a half turns. Because of this appearance, the joints are often termed triple twisted. 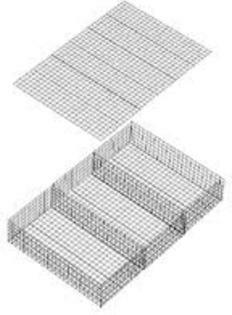 The mesh opening shall be hexagonal in shape and uniform in size measuring 2-1/2 inches by 3-1/4 inches. 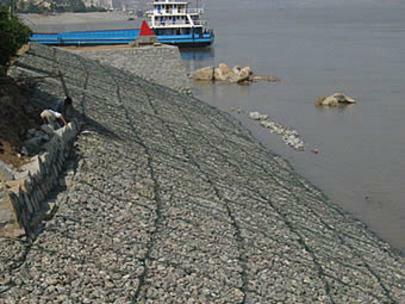 All wire used in the fabrication of the gabion mattress and in the lacing operations shall conform to Federal Specification QQ-W-461H, Class 3, Finish 5, soft, and have an average tensile strength in accordance with the current ASTM A 641, Table 2, measured before fabrication of the netting. 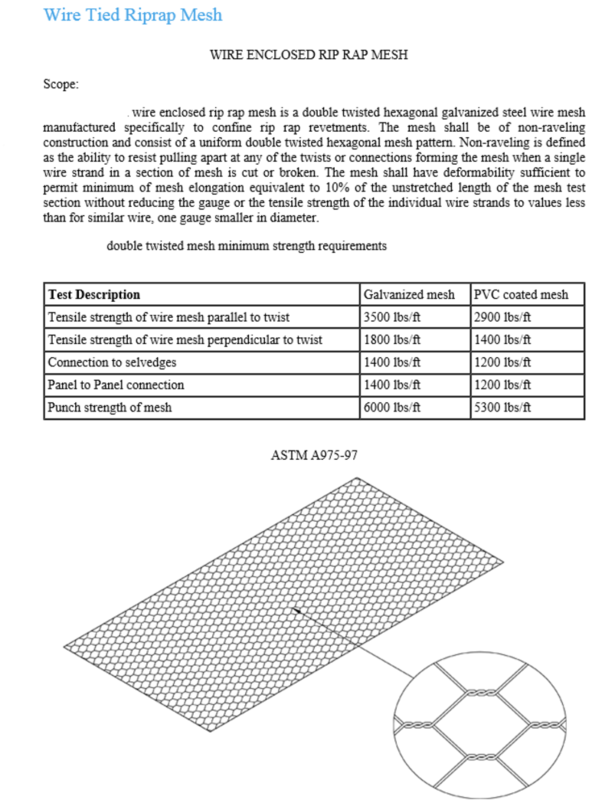 The nominal diameter of the wire used in the fabrication of the netting shall be 0.0866 inches minimum, subject to diameter tolerance in accordance with the current ASTM A 641, Table 3. Tests shall be conducted on the wire before fabrication on the mattress on a sample 12 inches long. Elongation shall not be less than 12%. 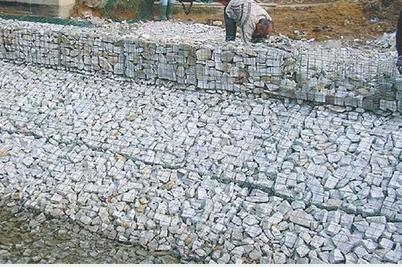 All wire used in the fabrication and construction of the gabion mattress shall be galvanized according to ASTM A 641, Table 1. The minimum weight of the zinc coating shall be according to the table following when tested in accordance with ASTM A 90. Adhesion of the zinc coating to the wire shall be capable of being wrapped in a close helix at a rate not exceeding 15 turns per minute around a cylindrical steel mandrel having a diameter 3 times the nominal wire diameter being tested. After the wrap test is completed, the wire shall not exhibit any cracking or flaking of the zinc coating to such an extent that any zinc can be removed by rubbing with bare fingers. All edges of the mattress including end panels and the diaphragms, shall be mechanically connected in such a way as to prevent unraveling of the mesh and to develop the full strength of the mesh. The wire used for the selvedge shall have a diameter greater than that of the wire used to form the mesh. 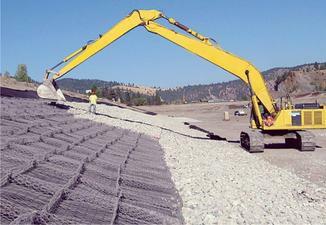 Sufficient lacing and connecting wire shall be supplied with the gabion mattress for all wiring operations. The nominal diameter of lacing wire shall be 0.0866 inches minimum. According to engineering and design requirements the mattress shall incorporate internal diaphragms to form cells having a nominal length of three feet. 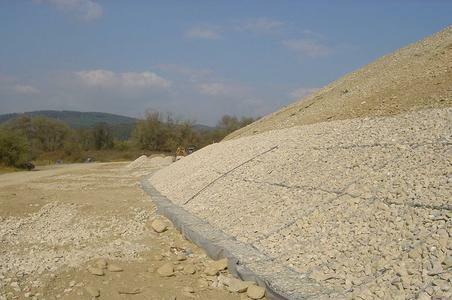 The internal diaphragms shall prevent rock migration within the gabion mattress unit. The DURA-FLEX Heavy Duty Mattress was designed specifically to accommodate stone size of 3 to 6 inches (75 -105mm). Only hard durable stone shall be used as mattress fill. 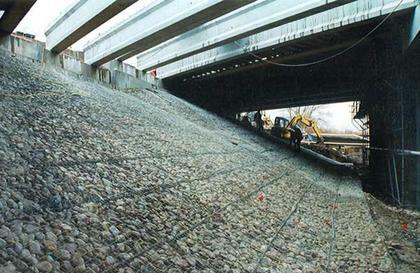 On channel slopes, the mattress shall be placed perpendicular to the flow in the channel with the shorted dimensions of the diaphragm going up and down the slope. On the channel bed, the mattress shall be placed so the flow runs parallel with the short dimension of the mattress compartment, while the width of the mattress runs across the channel bed. An approved corner closure tool shall be used to adjoin adjacent mattresses to insure a tight, neat seam and minimize mattress wire joint deformation. 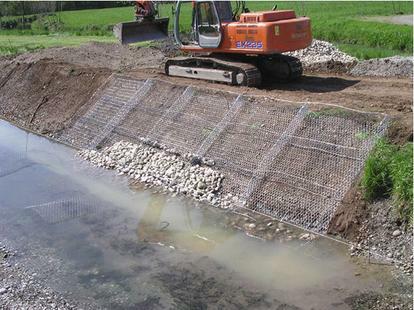 * GABION SUPPLY reserves the right to amend these specifications without notice.